Kilauea Volcano Could Erupt 'Explosively,' But What Does That Mean? An ash column rises from the summit crater at Kilauea volcano following a small explosion on Wednesday. 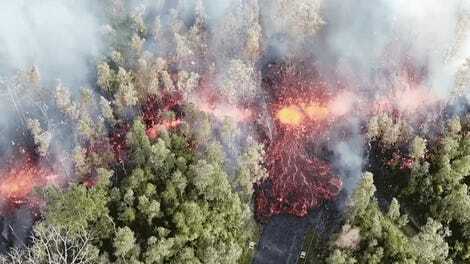 The outlook for Kilauea volcano took a turn for the worse this week, when the U.S. Geological Survey’s Hawaii Volcano Observatory (HVO) warned that the dramatic draining of the summit crater could herald an “explosive” eruption. 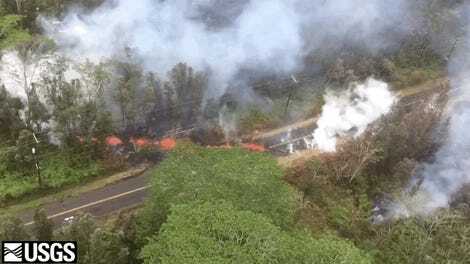 The action at Kilauea that has gripped the world’s attention for the past week has mainly consisted of lava oozing out of fissures in Leilani estates, along with volcanic smog-forming sulfur dioxide. But at the same time, Kilauea’s summit crater has undergone wild transformation. What was recently an overflowing lake of lava has dropped by nearly 300 meters (1,000 feet), and now appears like the eye of Sauron staring angrily up at us from some hellish underworld. The summit lava lake on May 6. If that lake continues to drain, scientists at the HVO now believe it could set off a cascade of events that lead to violent explosions of rock from the summit, along with widespread ash-fall. 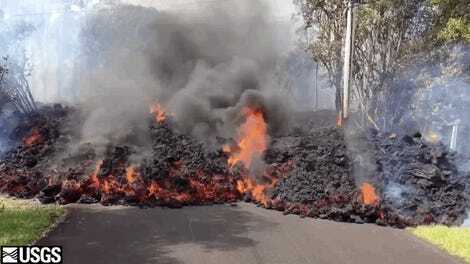 This kind of action is typically associated with stratovolcanoes like Mount St. Helens in the Cascades rather than shield volcanoes like Kilauea. But while the explosive results may look similar, the processes that lead to them are unique. 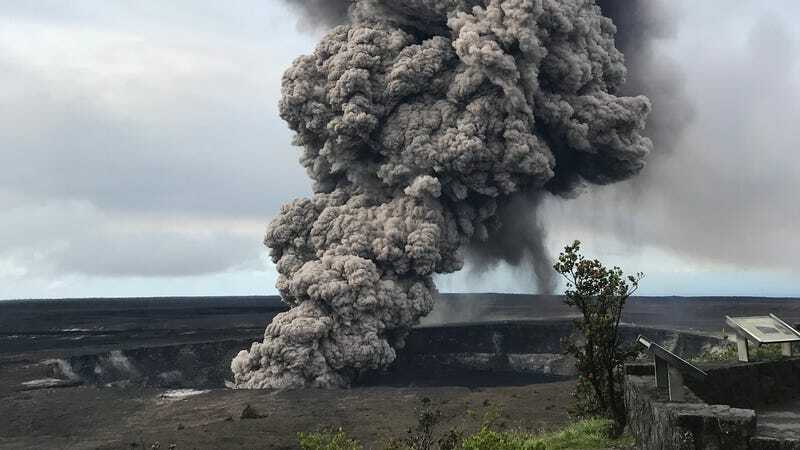 “So this is not a typical magmatic Cascade-type [explosive] eruption, it’s very different and that’s because it’s driven by steam,” Janine Krippner, a volcanologist at Concord University, told Earther. Here’s how this explosive steam engine would work. Scientists think the rapidly falling lava lake is being supplied by a much larger underground magma chamber via a relatively narrow column. As the height of the column continues to drop, eventually it’ll fall below the water table. When that happens, water which is now being naturally repelled from the lava column by the intense heat will be able to flow in, rapidly expanding into steam. In a best-case situation, that steam would just rise up the column and escape. But the column itself is unstable, as evidenced by rockfalls on Wednesday from the walls of the summit crater. As Krippner explained, too much infalling rock from the walls of the column could effectively seal over the lava tube. And that could cause a serious buildup of steam-driven pressure beneath the surface, triggering explosive eruptions that fling multi-ton ballistic projectiles into the air. Diagram indicating how an explosive eruption at Kilauea would work. This isn’t just educated guesswork. The exact scenario played out at Kilauea nearly a century ago, in May 1924. As the USGS details on its website, a lava lake drained out of the summit crater, triggering earthquakes and transferring magma into the East Rift zone (sound familiar?). Eventually, Kilauea saw a series of violent explosions that belched clouds of rock into the air for two weeks. “Similar explosive eruptions will happen again,” the USGS writes. Krippner emphasized that an explosive eruption at Kilauea, while dramatic, wouldn’t be nearly as dangerous in terms of flying rocks as a big explosive eruption at a stratovolcano like Mount St. Helens, which can jettison huge chunks of material many tens of miles away in addition to producing deadly pyroclastic flows. A steam-driven explosion at Kilauea isn’t expected to fling boulders far beyond the summit, where thankfully, nobody lives. The more widespread threat from an explosive eruption at Kilauea is ash fall, which can trigger serious respiratory problems, Kripper said. The USGS notes that during the explosive eruptions of 1924, ash clouds may have reached as far as 20,000 feet above the summit, depositing material over an area ranging from North Hilo more than 20 miles north to Waiohinu a similar distance southwest. It’s important to note that nobody can say for sure if a large explosive eruption will happen. For now, scientists will continue to monitor the lake level to see if it drops below the water table, and keep an eye out for large rockfalls. Volcanoes are complex, unpredictable beasts, and at a certain point, it’s just a matter of watching and waiting. “With steam eruptions, there’s usually very little warning,” Krippner said.